The first cycle of the Northern Californian Ring has come to an end on 19 June with an overall wonderfully executed Götterdämmerung. The orchestral performance was especially remarkable, as Donald Runnicles and his musicians finally found a truly Wagnerian sound that, at times, had been lacking during the previous nights. 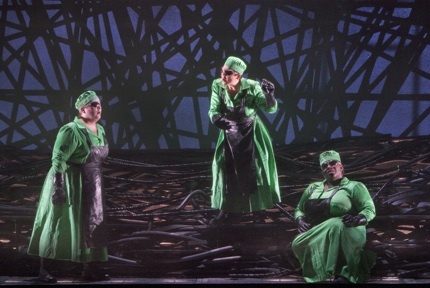 This staging of Götterdämmerung is a San Francisco Opera premiere. From a conceptual point of view, it summarizes Francesca Zambello's vision while at the same time proposing further ideas. The prologue, featuring the Norns weaving the rope of Destiny until it unexpectedly breaks, was one of the most effective scenes of the whole Ring: a scrim emphasised the distance between stage and audience; on it, green and black shapes of an electrical circuit materialized as the Norns were weaving. The translation in the supertitles reinforced the electronic imagery – "das Seil" (the rope) was translated as "the cable(s)." Dressed as peculiar surgeons/smiths/lab technicians, with green gowns and black aprons, the Norns handled a large black cable that burst with a sparkle as it broke in their hands. The pile of cables accumulated by the Norns and the intricate patterns of straight black wires in the background produced an interesting contrast: the confusion of these elements clashed with the ordered circuits, thus highlighting the attempts to keep Destiny clean and rational versus the chaos of the actual events. Black and white tones pervaded the digital projections accompanying scene changes. In the passage from the Prologue to act I, images of a grim and polluted landscape and power plants invaded the screen. Toxic drain waters appeared as the Rheingold motif surfaced from the orchestral texture. From the huge transparent wall that is part of the staging, we saw the hall of the Gibichungs located in such a devastated environment – we were lead to think that the Gibichungs participate in causing such a natural disaster. White and silver minimal furniture and glass and chrome details in the architecture conferred the space a modernist, almost fascist, flair. This particular nuance was emphasised by the setting of the last scene of act II, which defined the space by imposing big-scale elements – a wide staircase leading to a huge platform – populated by the chorus members dressed and acting as members of a military corps. The depiction of such places was very effective: they conveyed the sense of a claustrophobic world, that was imploding because of the greed and carelessness of the people inhabiting it. Yet, there is a downside: as customary in this production, these ideas were flooded by additional, almost never-ending concepts, that, in my opinion, though displayed in the setting and costumes, were not sufficiently elaborated. In particular, I am thinking of the second scene of act III, in which Siegfried joins Hagen and the other hunters, after meeting the Rheinmaidens. 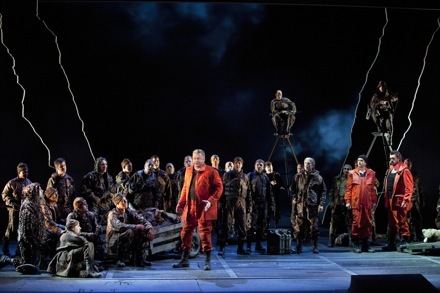 The setting is a battle field, featuring the hunters dressed as soldiers, and the three protagonists – Siegfried, Hagen and Gunther – inorange suits. I am unsure as to what was being referenced with those costumes, but I immediately associated them with the bright orange uniforms of Guantanamo Bay inmates; this reference was made stronger by a later instance: the Rheinmaidens would kill Hagen suffocating him with a plastic bag – surely a critique of pollution, but that particular image was also reminiscent of the Abu Grahib prisoners' abuse. This scene was somewhat out of context, as it contained many (tragic) cultural references that lacked further critical engagement or even narrative justification (in fact, many from the audience laughed at Hagen's death by suffocation). Overall, the military imagery exploited in this production presented several problematic aspects that which remained unresolved. Finally, as for the staging, the most disputable directorial choice was the immolation scene. Of course, this is a tricky one to stage, as it is so culturally and narratively charged, and it is difficult not to fall into rhetorical moves. Interestingly, Zambello and her team presented a bare stage, in which Brünnhilde is oddly accompanied by the Rheinmaiden and Gutrune in her farewell to Siegfried, from the very beginning of her long solo. 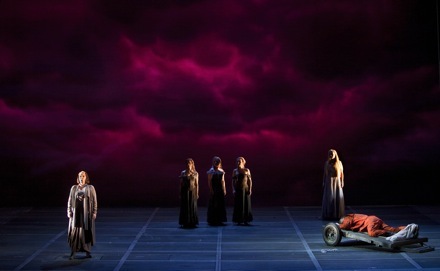 Brünnhilde's near-solitude was very powerful and refreshing. Yet, I found the insistence on having the other women with her to be unfortunate: too many characters from the story were interfering with the solemnity of Brünnhilde's acts. This choice seemed to be motivated by Zambello's emphasis on offering unconventional portraits of women in her Ring: in Das Rheingold, Freia's Stockholm syndrome towards Fasolt was an interesting – if perhaps underdeveloped – concept. Brünnhilde herself was established as a peer to Wotan, more so than in other productions. This was made possible by the intelligent exploitation of dramatic moments in which the character, Brünnhilde in this case, was not singing, or just listening: even the smallest gestures were put to the service of a multi-dimensional role construction. This fit perfectly not only Stemme's powerful stage presence, but also the whole cast, major and minor roles alike. The ability to understand the inner motivations of the characters shows Zambello's attentiveness to the dramatic needs of the work. And even the last scene could be interpreted as a desire to emphasise the role of women. Yet, I think that that case represents perhaps a limit to her re-interpretation of certain aspects of the drama. While I think that there are shortcomings to her vision for this Ring, I am convinced that Zambello is a special director. What makes her work important is her cognisance of the most human and intimate dimension of an epic and mythical story such as that found in the Ring: the relationship between Brünnhilde and Wotan that I mentioned above, the playful and comic nuances (in the construction of Fricka, Brünnhilde, Mime, Siegfried and many other roles), and a quest for dramatic sophistication, were all transparent, and contributed to a moving rendition of this difficult work. As I mentioned above, the opening scene was superbly rendered. Ronnita Miller (who had also successfully played Erda), Daveda Karanas, and Heidi Melton offered a powerful reading of an important moment. Their strong timbre melted beautifully with the orchestra as they recollected past events in the story. From the first line, it was clear that Ian Storey's Siegfried could be a solid character, both vocally and dramatically, able to find a harmony with Stemme's Brünnhilde and with the orchestral texture – something that has been lacking in this Ring. In fact, at times Storey could even overpower her, in their initial duet, and in a harmonious fashion: this brought to the surface a juvenile liveliness and ardor very well fit to his character. His performance remained excellent until, suddenly, his voice broke completely, becoming inaudible. After the first interval, general director David Gockley announced that Storey had a vocal problem, and that he was indisposed. Nonetheless, he continued, asking for the audience's indulgence. His voice did not recover. At the same time, however, his acting was quite solid throughout the performance. In the modernist home of the Gibichungs, Gerd Grochowski as Gunther and Andrea Silvestrelli as Hagen constructed two powerful characters, truly convincing in their relationships both with each other and with the other protagonists. Grochowski's timbre was not particularly profound, but his lines were precise and sharp; Silvestrelli, instead, possesses a somewhat metallic tone that helped him build a merciless and imposing figure, even if with some vocal uncertainties; his pianissimos were particularly effective, conferring an even more sinister shade to his Hagen. Melissa Citro's Gutrune was vocally unconvincing: her vibrato was very wide, and she would struggle to reach the highest tessitura; nonetheless, she managed to build a reliable character thanks to her refined acting skills. 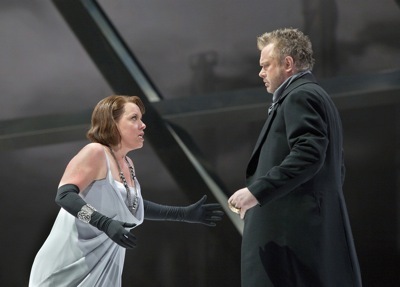 The heroine of the Ring, and of this particular Ring too, was surely Brünnhilde – Nina Stemme's Brünnhilde. With her first complete Ring, she demonstrated that she probably is the best Brünnhilde of our years. In this Götterdämmerung, she explored a whole new range of colours and emotions. In the opening scene, she seemed to be less secure than earlier performances, being sometimes overpowered by the orchestra. Yet, she warmed up, and her singing was punctuated with several breathtaking climaxes: her rebellion to the wedding with Gunther, and her swearing of the oath on Hagen's spear was terrifying, given the passion and fierceness that she embodied. And even if the immolation scene was sadly marred with a questionable staging, this did not prevent Stemme to give life to a flaming solo with the orchestra: Stemme engaged her whole body and voice with the music and with her role. It was a truly cathartic moment taking place on stage. The orchestra's performance was heartfelt: under the baton of Runnicles, the musicians offered many moments of beauty, finally taking advantage of dynamics palette. Siegfried's Funeral March was perhaps the apex of the whole Cycle: a truly Wagnerian color emerged from the pit. It is evident that some sections, such as the brasses and at times the strings too, should have presented a more chiseled work: during the moments when the orchestra was more exposed, technical flaws were evident. In conclusion, while there were ups and downs, for me this Ring was a success and should not be missed: the artistry of Runnicles and Stemme, the sensitivity of the acting, and the ideas that Zambello developed entirely throughout the whole Ring (such as the environment theme) made this an important achievement. What is more, the thousands of people that attended the performances and participated with their enthusiasm were part of this success as well: this special occasion demonstrated once again that the San Francisco Opera is a special place in which to make music, enjoy it, and be inspired by it.